These resolutions use the previous year’s ECOSOC resolutions as starting points. ECOSOC has the ability to amend the resolutions when they consider them during their annual sessions, but in reality, it tends to rubber stamp what the Commission has submitted. Please note that this blog post focuses on the WSIS implementation resolution as it is the set of negotiations that I followed last week. The CSTD has 43 Member States. These Member States are chosen by the 54 Member States of ECOSOC. The UN General Assembly has 193 Member States. Therefore, the ECOSOC resolutions on science and technology and WSIS implementation are developed by a UN agency that contains just over one-fifth of all UN Member States. In practice, though, any Member State can participate in the CSTD’s development of the draft resolutions. CSTD membership only matters if things need to go to a vote. And the general feeling is that if things need to go to the vote, it basically means the process has failed. So, to date, there has never been a vote on CSTD’s draft resolutions. As well as all UN Member States, the CSTD allows a number of non-governmental entities to participate in its work, including those with WSIS accreditation or ECOSOC accreditation. At the 19th Session, representatives from ITU, UNESCO, UN Women and UN DESA, staff members from ICC BASIS, ICANN, ISOC, and APC were present, as well as a researcher from the University of Essex and a small business operator (mCADE LLC). I attended under the ARIN banner. There were also some other faces present that I did not recognize. Non-Member States have gradually been able to participate more fully in the drafting negotiations over the past few years, at the discretion of the chair of the negotiations. This year, the chair of the WSIS-related negotiations (Canada) was very receptive to the inputs of non-government participants and regularly called on any non-government participant who raised their flag (what you and I would call a large “tent card” if we weren’t in a UN meeting). In addition, rather than making the non-government participants trudge around the corridors in the breaks, hoping to find a Member State willing to “adopt” their proposed text as their own (and therefore making it possible to appear as part of the official compilation draft), the Chair, after a non-government representative had presented their idea, would ask, on the spot, if any government in the room was willing to sponsor/adopt the proposal. Last year’s WSIS implementation resolution was adopted by plenary at the unusually early hour of 6:40 pm on May 10. Previous years had dragged on well past midnight, and on at least one occasion ending at 2:30 am on the Saturday morning. Usually, the Internet-related parts of the resolution were the biggest sticking points. The only reason that the CSTD’s draft of the 2015 WSIS resolution was adopted so early was that it had become very clear that there would be no agreement to proposed changes to the resolution. 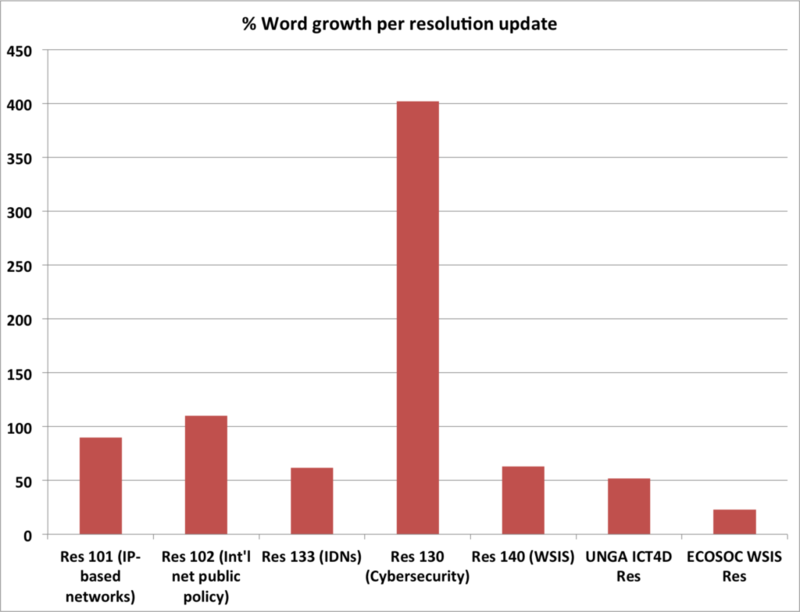 At issue was the fact that some Member States had wanted to add forward looking text to the resolution, looking beyond the WSIS+10 anniversary toward the next phase of implementation, while others believed it was premature to make decisions before the UN General Assembly had completed its 10-year review of the WSIS (in December 2015). Late on the Friday afternoon, it was very clear that there was not going to be any possibility of compromise between those two positions. The only possible solution – other than to not have a resolution at all – was to stick with the 2014 resolution, just with updated dates and names/numbers of annual meetings and resolutions referenced in the resolution. Everyone agreed that substantive changes would be deferred until after the WSIS+10 UN General Assembly (UNGA) had been decided. The zero draft sent to Member States highlighted sections of the text that may have been useful to consider updating in the wake of the WSIS+10 resolution at UNGA (December 2015) and the 2030 Agenda for Sustainable Development (September 2015) being adopted. However, in hindsight, it was perhaps a little ambitious in its expectations that Member States would want to overhaul the complicated, often redundant, text that had built up over many years of compromises that allowed the resolutions to be passed, if not to make particular sense to anyone who hadn’t been in the room at the time. The Western European and Others Group (WEOG) were keen to start afresh and streamline the resolution and make the issues it contained clearer and more succinct. For WEOG states, the resolution had become overly complicated and unreadable. Because of the difficulties in previous years’ negotiations, it had built up a considerable amount of text about events and activities that had long since been held or begun. 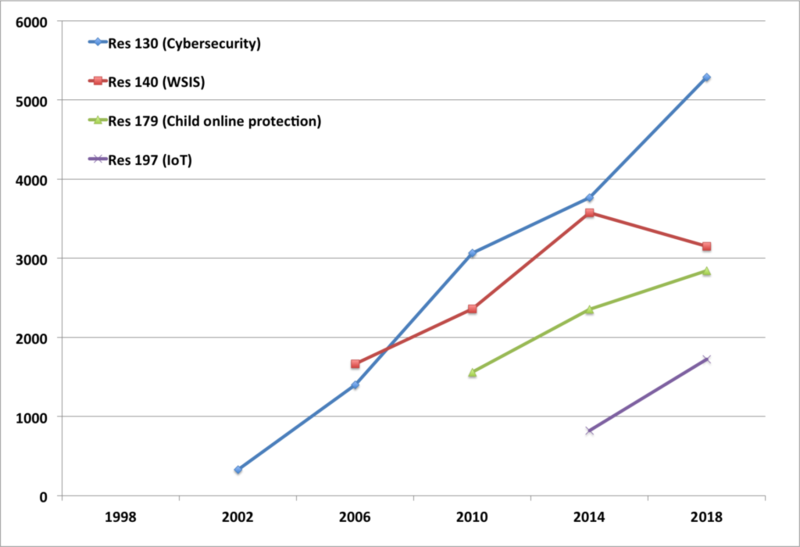 For the WEOG states, it was more important to focus on the future, particularly since they viewed the WSIS+10 UNGA resolution as a kind of “reset” button on WSIS activities. Many of the developing countries were suspicious of WEOG proposals to delete paragraphs and replace them with merged, shorter text on the same issues. 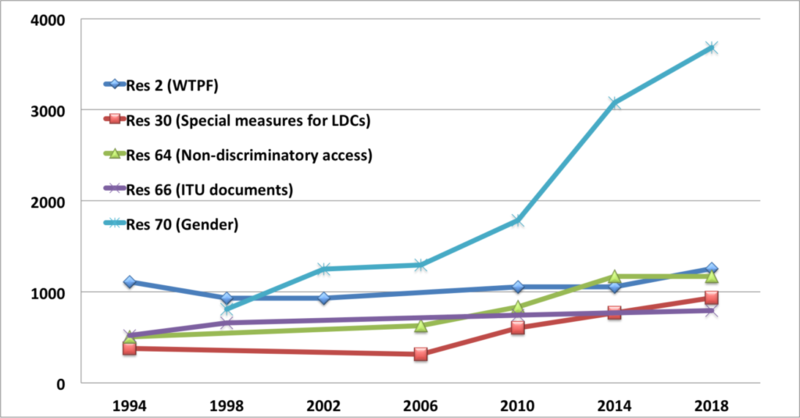 For those developing countries, there was consternation that the deletions seemed overwhelmingly related to text aimed at the challenges faced by developing countries and that deletion of this text would disadvantage them. In addition, for governments who felt that the existing resolution was to their advantage, deletion of text from that resolution would mean risking their ability to maintain an advantage in the new text. Finally, some states were concerned that there was not enough time to update the text. It is certainly true that unlike other UN bodies and processes, where governments submit their proposed changes weeks or months in advance, CSTD’s process is very truncated, with governments only submitting their edits the week of the CSTD session, leaving a maximum of 2.5 days to negotiate together on the text. However, it is also symptomatic of UN glacial slowness that the UN can pass two major resolutions that set the way forward for development and ICT for the next 10-15 years but one of its subordinate bodies chooses not to incorporate those big changes in a resolution designed to monitor the implementation of one of those processes. As usual, Internet governance was a big area of contention. The composition of the second Working Group on Enhanced Cooperation (WGEC 2.0), announced during the WSIS Forum 2016, particularly problematic. 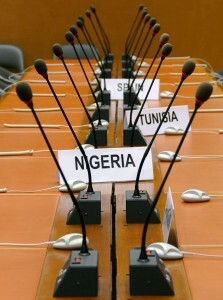 Developing countries felt that their interests were being sidelined in the final lineup of the working group. The overwhelming majority of the intergovernmental and international organizations and the technical and academic community representatives were from the developed north. In addition, for the CSTD regional groups that had had a very difficult time in nominating only four states to represent them on the WGEC, it was hard to accept that the WEOG and African Group had five members each (WEOG had such a hard time that the Chair of the CSTD, Peter Major of Hungary, had to choose the final member). 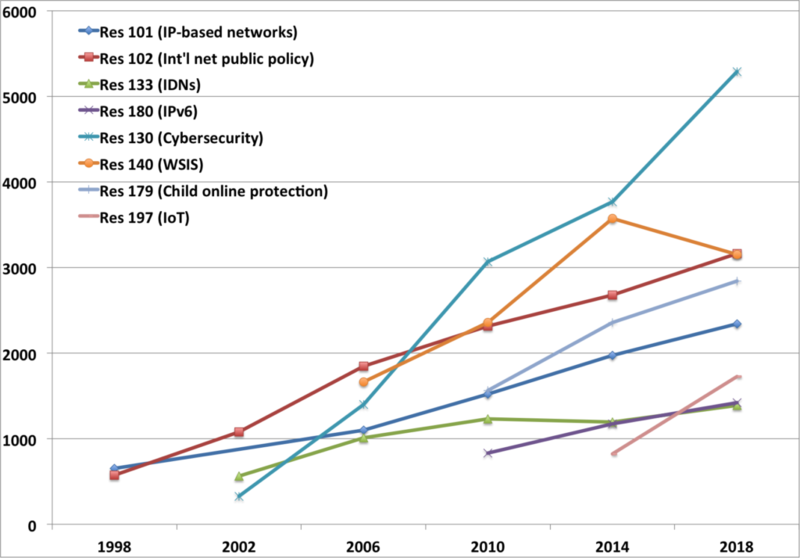 The fifth member of those two groups was a result of Switzerland (CSTD membership ends 2016) and Tunisia (not a CSTD member) being the hosts of the WSIS process, 2003-2005. However, if you were a state that had missed out because you weren’t a CSTD member now, or wouldn’t be a CSTD member for the entire life of the WGEC, the inclusion of these two states could be seen as a bit of an insult. Therefore, there was a big push to allow all UN 193 Member States to be able to participate on an equal footing, should they wish to participate, in the working group. 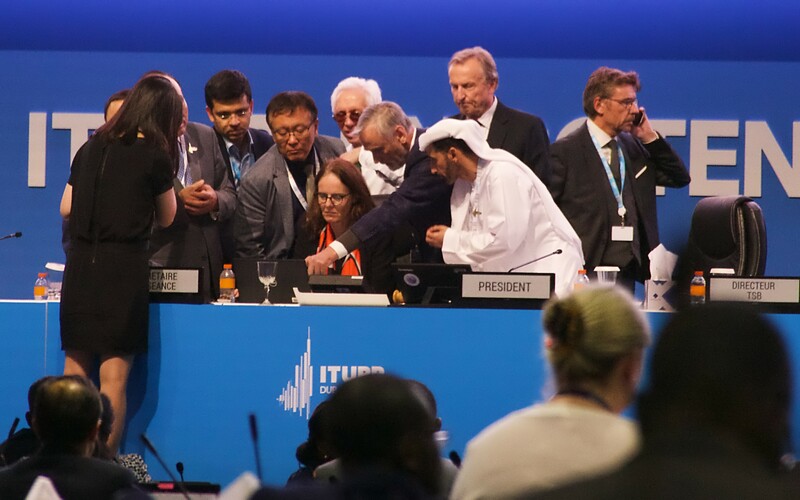 There was an equally big push, however, from the other side, which pointed out that the WSIS+10 resolution had left it up to the WGEC itself to decide its modalities – not the CSTD. IGF supporters wanted to add text that mentioned some of the progress made in improving the IGF, such as the inter-sessional work on policy options to connect the next billion, the Best Practice Forums and Dynamic Coalitions. Those less supportive of IGF thought that this was unnecessary detail for the ECOSOC resolution. Development was also a big issue. WEOG states had tried to consolidate various sections of the past resolution so that all development-related material would be shorter, less distributed throughout different parts of the text, and easier for people to understand. However, many states from the developing world felt that the proposals to consolidate the text were removing subtle, but important, nuances in the development oriented text. WEOG states said they had no intention of deleting anything important and, during the negotiations, had been working to update their proposed texts to incorporate elements that the developing states had said were vital to them. However, with the limited time available, there just wasn’t the time to complete this exercise to everyone’s satisfaction. Once 6 pm hit on Friday night, gradually, a number of the Member State representatives and some of the observers started leaving. Partially, this was because a number of the Member States were represented by their mission staff who were only there to observe, rather than be active participants. After 6 pm, for Member States who weren’t actively invested in the outcomes of the draft resolution, there really was no point in staying. Other Member States had multiple representatives in the room, and so didn’t need to have all their representatives stay on. Others simply had prioritized their lives over being stuck in small room eating vending machine supplies for dinner and had booked flights out of Geneva on Friday night. This meant that only the incredibly committed (and possibly certifiably insane) stayed on to the end. 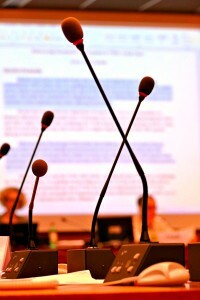 At around 1 am, one of the governments suggested that given the massive amounts of text left to work on, and the late hour, there needed to a decision to either hold a resumed session in a few weeks or to produce a massively truncated text that basically recalled the WSIS+10 and SDG resolutions and reaffirmed a commitment to implement the goals. Then, next year, the government representative said, we could embark on a longer preparatory process that could consider the various ways to develop a post-WSIS+10 resolution that met everyone’s needs. 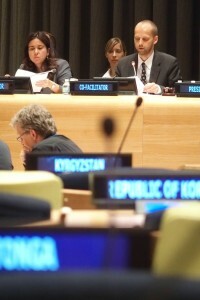 In response to the nuclear option, the chair of the drafting group suggested that the group could adopt a different type of barebones resolution: this one would recall the 2015 ECOSOC resolution on WSIS (the one that was the 2014 ECOSOC resolution, just with updated dates and resolution and meeting references) as well as recall the SDG resolution, the WSIS+10 resolution, and request the Secretary General to submit his report to ECOSOC. At this point, the chair of the drafting group called for a break while he consulted with various delegations about how to proceed. After a break that lasted just over an hour, the chair of the drafting group resumed the meeting with a new proposed way forward: a facilitator’s text. In the event that participants are having so much trouble reaching any form of consensus, a facilitator’s text can be the best way forward. The idea is that the facilitator/chair of the drafting negotiations could put together his/her own compromise version of a resolution based on her/his sense of what could gain consensus in the room. 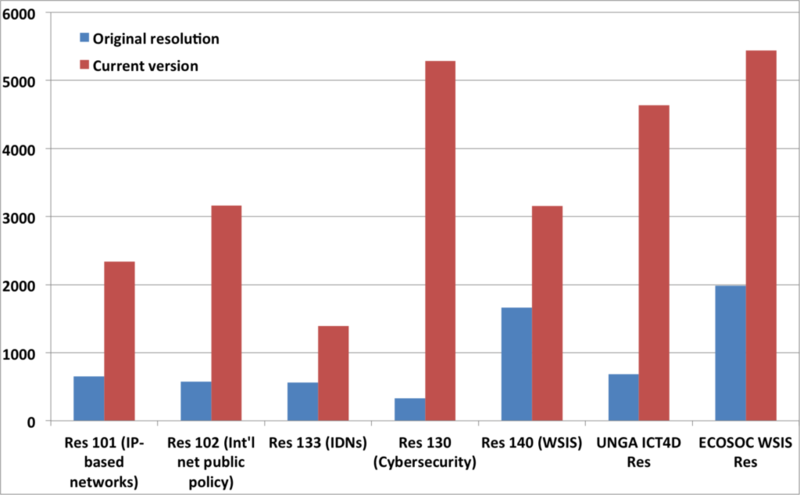 This is how the WSIS+10 resolution at the UN General Assembly was drafted during the preparatory process last year in New York. Recognizing how very difficult the topic was, the two co-facilitators, United Arab Emirates and Latvia, “held the pen” throughout the drafting process, even though there were some attempts by some of the Member States to have direct control over the drafting. Compromise text on enhanced cooperation developed by Brazil, which had facilitated informal discussions on that section on Thursday night. Text on the reporting mechanism from the CSTD to the ECOSOC High Level Political Forum would be deleted (many hours had been devoted to trying to understand what exactly CSTD reports consisted on and whether or not Member States could change the format of the reports that were sent to this particular High Level Political Forum). Some other bits of text that had not had complete consensus were, in the spirit of compromise, were either kept in or deleted. Not everyone in the room was happy with the resulting text, but there was widespread recognition that possibly, via this facilitator’s draft, everyone would be less unhappy than if we had continued with everyone’s hand on the drafting pen. One state – not a CSTD member – was particularly unhappy and made their position very clear. When the chair of the negotiations asked if all governments could accept the facilitator’s compromise text, all but that one state was willing to adopt the text. The state insisted that their reservation be included in the report of the meeting, which was agreed to. In many ways, the fact that a non-CSTD Member State was able to have so much influence on the process and have their objection included in the outcomes of the meeting report shows how open the CSTD is to the participation of all Member States. A number of non-CSTD Member States were at the meeting and did participate. Belarus, for example, was a non-CSTD member that was active in the WSIS negotiations as was Saudi Arabia. Australia was also present, but less active, given it is currently in caretaker mode (federal elections are at the start of July). The inclusion of more UN Member States, and of other accredited entities, in the CSTD’s work can only make its deliberations richer and more representative of the wider needs and requirements of those who are the purpose for the CSTD’s work to draft ECOSOC resolutions in the first place. As one Member State repeatedly intervened to note during the WSIS negotiations, trying to reach consensus on the draft resolutions in less than a week is clearly an impossible task. As the issues of sustainable development and the role of ICTs become more and more politically important to the world, the process of drafting associated resolutions becomes more complicated and delicate. 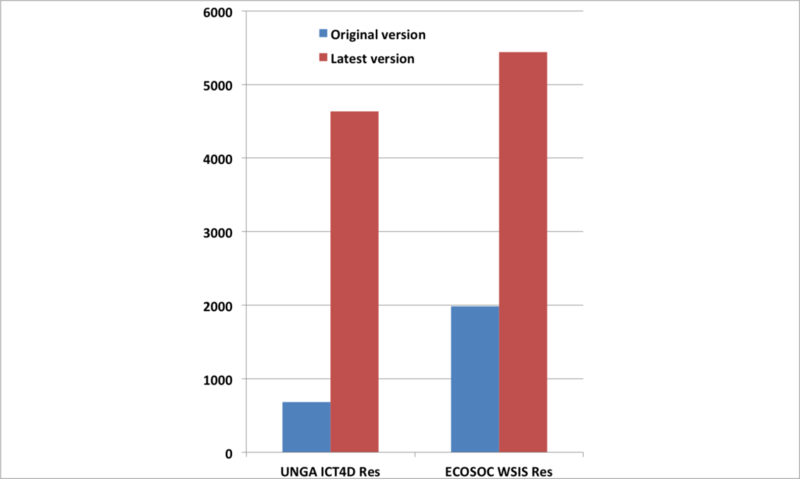 It remains to be seen if the CSTD changes its approach to drafting the 2017 ECOSOC resolution on WSIS implementation. CSTD only meets twice a year for a total time of less than two weeks. It also has a very streamlined secretariat provided by UNCTAD. Because of these factors, there is very little focus on the CSTD’s work for most of the year, and most governments do not assign specific liaisons to follow the CSTD’s work on WSIS. Instead, it’s the local mission-based staff who are sent. Or whoever has been assigned to work on ICTs and WSIS issues at ITU. This means that each time the CSTD meets to develop its WSIS resolution, it’s pretty much starting from scratch. Many of the participants don’t know each other and there is no thread of ongoing CSTD work throughout the year that binds people together. Unless ways to overcome these barriers are developed, we are likely to see similarly difficult negotiations in the WSIS implementation drafting in May 2017. Update: the non-paper is now available on the United Nations General Assembly (UNGA) website for the preparatory process for the WSIS+10 review. The date for submissions of comments on the non-paper has also been extended from 14 September to 18 September. When this blog was originally published, the non-paper had not been published officially, but had been sent to the IGF 2015 MAG mailing list on preparations for the main session on WSIS+10. First, if you want some background into what the non-paper is, who made contributions to it, and where it sits in the overall United Nations General Assembly (UNGA) preparatory process for the High Level Meeting on the WSIS+10 Review, see my other blog post, Background to the WSIS+10 non-paper. The co-facilitators of the preparatory process have done a remarkable job of distilling almost 400 pages of contributions into just over 4 pages of the non-paper (not counting 2 pages of letters at the front). Unfortunately, unless you speak fluent UN-ese, even those 4 pages are likely to be a bit confusing. Would you believe that the word “Internet” appears 15 times in the four and a bit pages compared to only 8 references to “ICTs” and 5 references to the “digital divide”? It seems that the World Summit on the “Information Society” has turned into 10-year review of the “Internet Society” (and no, I’m not talking about ISOC). This is both probably somewhat alarming to some stakeholders and also to be expected, given the Internet is becoming a fundamental tool for so much of the world’s activities these days. A lot has been achieved, but there is still much to do to bridge evolving forms of the digital divide. ICTs can play a major role in achieving the Sustainable Development Goals. Multistakeholder cooperation and engagement is supported. There is a need for gender equality. There should be “universal Internet access” by 2030. Governance of the Internet should involve all stakeholders. There is a need for the internationalization of Internet governance, including the full implementation of enhanced cooperation. Extend the mandate of IGF, but with a few things that need possible improvement. Cooperate globally to combat cybercrime and cyber-threats. Put more effort into financing ICT development activities. There needs to be better data collection and analysis to better evaluate progress on WSIS issues. Keep reviewing WSIS outcomes annually and have another review of WSIS in the future. Below is a summary of the suggested principles and post-2015 landscape. Please note that I have edited the text of the original non-paper for clarity and brevity. The headings, however, are straight from the non-paper. Increase the number of women with Internet access. People have the capabilities to make use of ICTs. Encourage all stakeholders to take measures to achieve universal Internet access by 2030. Increase efforts in capacity building, technology transfer, and multilingualism. Use ICTs as a critical enabler to achieve the Sustainable Development Goals. The full implementation of Enhanced Cooperation. Consider the need for clearer terms of reference for IGF’s governing structure, working methods, and outcomes. Continue building upon current efforts to ensure support for the participation of least developed countries, landlocked developing countries and small island developing States. Increase global efforts and cooperation in combating cybercrime and countering cyber-threats. Mobilize domestic public and private resources to spur ICT access and content creation, particularly in a wider range of languages. 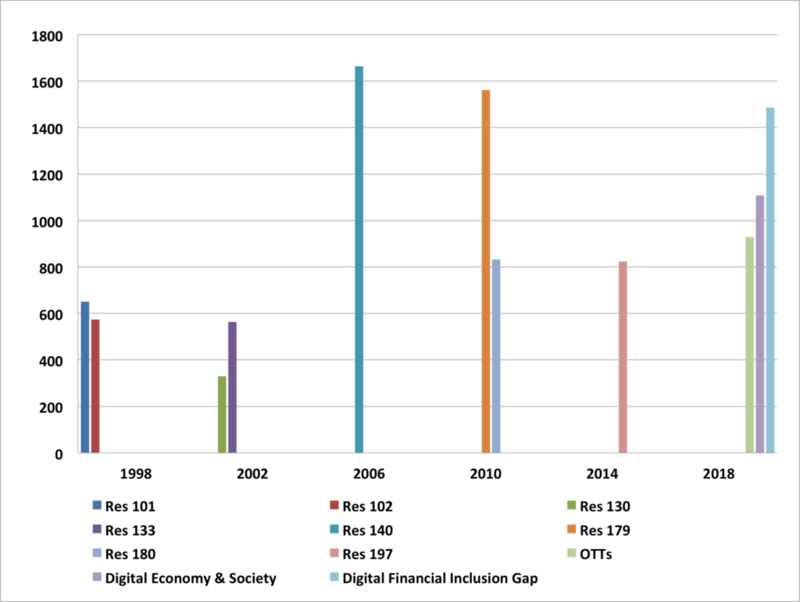 Review the lack of progress in the Digital Solidarity Fund. Encourage official development assistance and financial flows, including foreign direct investment, to developing countries that need the most assistance in achieving ICT goals. Give ICT a prominent profile in the new technology mechanism established by the Addis Ababa Action Agenda. Improve data collection and measurement so it’s easier to assess how well WSIS goals are being achieved. 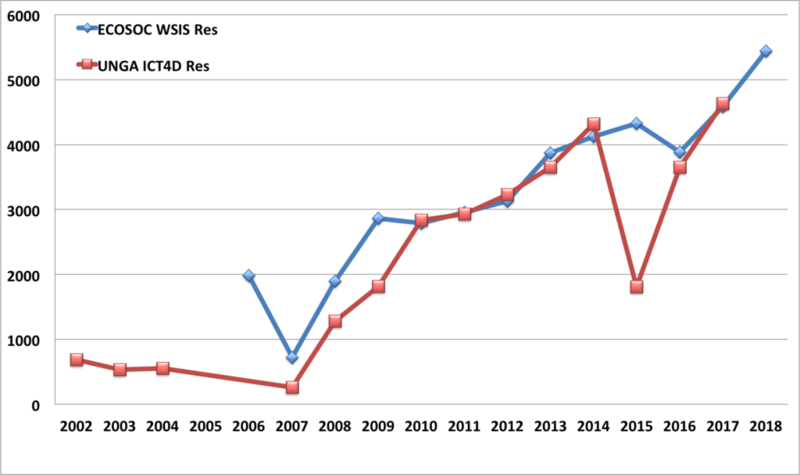 Keep reviewing WSIS outcomes annually, and hold another overall review in the future. Commit to mainstream gender in WSIS implementation, notably through the Action Lines. The same rights that people have offline must also be protected online. All human rights and fundamental freedoms, including the right to development, to achieve the WSIS vision. Respect freedom of expression, the independence of press and the right to privacy. No person shall be subjected to arbitrary or unlawful interference with his or her privacy, family, home, or correspondence,c onsistent with countries’ obligations under international human rights law. Mitigate the environmental impacts of ICT use and growth. Governance of the internet should be open, inclusive, and transparent, within the working definition of internet governance as ‘the development and application by governments, the private sector and civil society, in their respective roles, of shared principles, norms, rules, decision-making procedures and programmes that shape the evolution and use of the Internet. The management of the Internet encompasses both technical and public policy issues and should involve all stakeholder groups. Confidence- and security-building initiatives are important for the future of the information Society. The Addis Ababa Action Agenda and the 2030 Agenda for Sustainable Development provide an important framework for ICT policy and investment. Public-private partnerships and universal access strategies, amongst other funding and financing approaches, are important ways to spur ICT access and content creation. Capacity-building remains a primary focus. Data collection and analysis is an important part of how WSIS goals are being achieved. It is of potential concern that the non-paper differentiates between “cyberspace” and the “Internet”. “Cyberspace” is used as a catch-all term for Internet-related security issues. Is this a distinction that we really want to make? 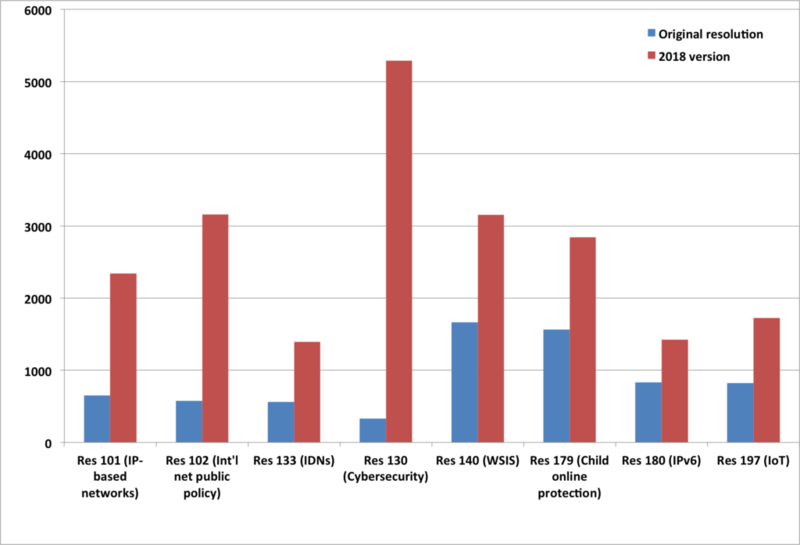 Do we want to be excluding security issues related to ICTs other than the Internet? The inclusion of “cross-cutting technical challenges” in the non-paper demonstrates the increasingly blurred line between public policy (the responsibility of the Member States who will ultimately decide the contents of the final outcome document) and technical management of ICTs. This line was in reality always blurred, but when ICTs were less ubiquitous in the world, governments were less interested in exercising their rights to have a say in the possible public policy implications of those ICTs. But as stakeholders on the technical side of ICTs engage more with governments, there is also an expectation that governments will also engage more with non-government stakeholders as part of a two-way dialogue on the policy implications of technical issues. We are seeing this increasing expectation of greater interaction play out not only in the UNGA’s WSIS+10 process, but also in the ICANN accountability process that is currently underway. Anyone who participated in the Multistakeholder Preparatory Process for the WSIS+10 High Level Event in Geneva in 2014 will remember how contentious proposed text about encouraging women’s participation in the Information Society was. The change in stance between Geneva and New York demonstrates how different Member State views can be depending on the forum. Update: the non-paper is now available on the United Nations General Assembly (UNGA) website for the preparatory process for the WSIS+10 review. The date for submissions of comments on the non-paper has also been extended from 14 September to 18 September. At time of the original posting this blog, the non-paper had not officially been posted but a copy had been sent to the IGF 2015 MAG mailing list on preparations for the main session on WSIS+10. Negotiations at the UN can obviously be highly political, so it can be advantageous to hold off publishing a formal input document (and the resultant skirmishing between States) as long as possible and instead publish an informal document to test the waters. But, of course, the use of unofficial non-papers is so widespread, that it’s now a UN equivalent of the emperor’s new clothes: collectively, in public, everyone pretends that the non-paper is a harmless informal document but, in private, everyone actually puts just as much effort into responding to it as they would to an actual official draft. The non-paper was developed by the co-facilitators of the UNGA WSIS+10 review process based on 74 submissions by governments and other stakeholders sent in during July 2015. The submission by G77 and China was given an extension due to the fact that the G77 consists of a whopping 134 governments. The co-facilitators of the process then had to whittle down the 387 pages of contributions into a single document that ended up only being just over 4 pages long. Although the non-paper is nominally an informal document, it still has to follow the formal protocol of being submitted to the PGA for approval and distributions. The comment period ends 14 September, which gives stakeholders two weeks to comment. An online comment form will be available when the non-paper is formally published. Who would have thought that the world of UN diplomacy would have so much in common with software programmers? In both cases, they start a number sequence with zero, not one! Oddly, though, the UNGA WSIS world seems to have missed basic mathematics and skips one entirely, moving straight to draft two. The zero draft, which ups the ante for diplomatic negotiations in New York, is meant to appear at the end of September. However, given the non-paper missed the end of August deadline, it is quite possible that the zero draft due date may slip a little too. When the zero draft appears, the non-paper’s short life ends. Following the publication of the zero draft, there will be another round of comments, followed by a second informal interactive stakeholder consultation in New York and a second preparatory meeting for UN Member States. For the full set of steps in the WSIS+10 process, see the Preparatory Process Roadmap. The Association for Proper Internet Governance submitted an individual contribution and is also part of the Just Net Coalition. Telefonica and the Africa ICT Alliance submitted individual contributions and are also part of ICC BASIS.